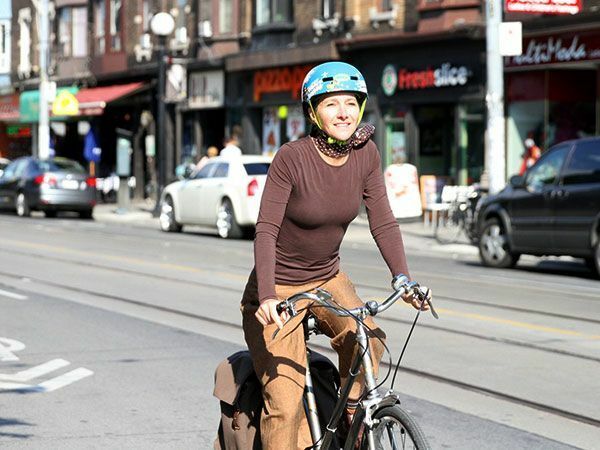 Kelly, 50, teaches grade one at Danforth & Coxwell, and rides there from Victoria Park & Queen East. "I am an ordinary rider who was frightened to ride on the streets of Toronto when I first moved here from San Diego. Now I ride all over. Cycling to work means I arrive energized and ready for the day." It also means she gets to to breeze by traffic and construction, and make quick stops on the way home. Thanks to Kelly's dedication, 243 students at her school rode in on Bike to School Day 2014, which helped the school win a bike rack!